Organic long romper with adjustable shoulder straps and fold-over cuffs. 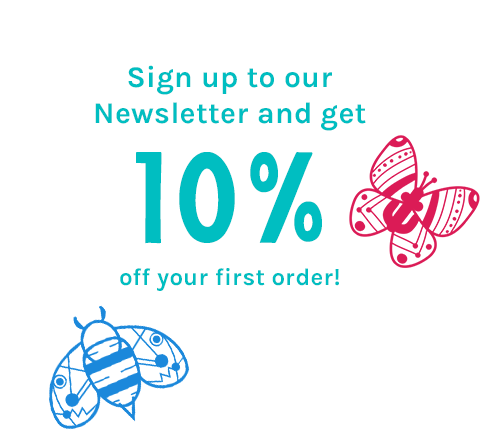 Beautifully designed to grow along with your little one. they grow. 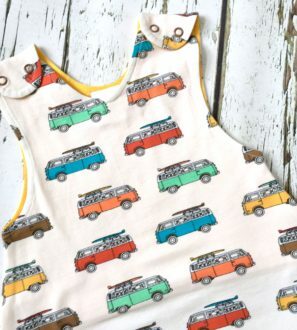 An added bonus is that it’s so comfy and cute, that it will be baby’s favourite as well as yours! adjustable straps, to really make it go the extra mile! For more info on sizing please refer to Size Info. Because of the low riding harem-style fit, these are very compatible with cloth bottoms. Fabrics have been washed to prevent shrinkage. Please wash inside out with similar colours at 30 degrees Celsius, and line dry. Avoid washing together with jeans, you might as well stick sandpaper in your washing machine! •I’ve been there! To aid with wriggly baby changes you can add snappers to the inside legs. Use the “With Snappers” option in the dropdown menu. 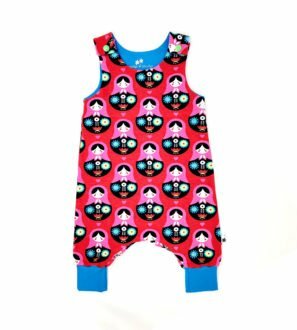 •If I’m sewing for a particularly slim or chunky child, please leave a “Note to Seller” and I’ll adjust the fit. add your personal message to the tag. So the lucky receiver will know who to thank! 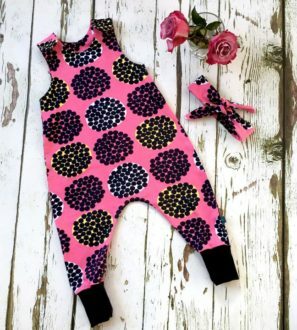 I started Baboosh Designs while I was on maternity leave with my first baby, I’d been sewing as a hobby since I was about 15 years old, and I’ve always loved making baby & children’s clothes. Now that I had my own baby I found that little ones outgrow their lovely clothes in the blink of an eye! This inspired me to start designing clothes that are made for growing- Baboosh Designs was born. Shipping policy need to be added here. Returns policy needs to be added here.